IT’S MORNING. EIGHT A.M., to be exact. My alarm goes off for no more than five seconds before I sit up to stop the nagging sound. As I stretch my arms, I realize how achy my body is. Still, it’s a wonderful aching every dancer knows. As many busy New Yorkers do, I click a few buttons on my computer and order my morning coffee—black, no sugar—and blueberry muffin from the corner deli to be delivered to the door of my Upper West Side apartment. Class starts at ten thirty at the Met. The ordinary rituals of my day belie what will be an extraordinary evening. I’m eager for this day to start so that, later, I can rise again, this time on the stage of the Metropolitan Opera House. Tonight, I will become the first black woman to star in Igor Stravinsky’s iconic role for American Ballet Theatre, one of the most prestigious dance companies in the world. My barre warm-up this morning would be familiar to any ballet dancer, whether she’s an apprentice in Moscow or a seven-year-old taking his first ballet class in Detroit. It’s slow structured yet fragmentary—perfectly designed to bring me to center, where I can dance freely without the barre, each motion a broken-down version of what tonight’s solos will be. I start with pliés, increasingly deeper bends of the knee which warm up my legs while still allowing them the support that they need. I transition to larger movements of the leg, circling them in my ronds de jambe, and bending them in fondus, gradually stretching my hips and knees. I finish with a port de bras, stretching my torso forward and from side to side. I move to center, where each aerobic exercise moves more fluidly to the next without the barre’s strictures. I know that each graceful glissade—where I jump in first position with both legs flicking to a dagger before closing into fifth—stems from that disengaged brush of the leg where my foot leaves the floor, which stems from a tendu, a single pointed toe that I’ve extended while maintaining contact with the floor. Ballets are just stylized versions of these seemingly basic movements on a grand scale. If the basic strength and elegance of a barre class is like slipping on a little black dress, the challenge of dancing a full three-act ballet is like learning to accessorize for any occasion. I have to think about whether I want to add sass or longing or, as I will tonight, the exotic, otherworldly energy of the mythical Firebird. You have to know the appropriate way to adorn each story and character with your body. Sleeping Beauty, for example, is very elegant and regal; its movements are fluid, with few accents. There are certain ways you have to hold your torso, position your head, and use your arms as a certain character that can differ from what I rehearse in class. The difference between being an amazing technician and being a soloist or principal is mastering those interpretive flourishes to tell the best story. Otherwise you aren’t a ballerina—you’re just another dancer. No matter how old you are or how long you’ve been dancing, ballet professionals know that we have to repeat these steps in class every day to maintain the strength and the clean positioning that’s so essential to dancers. I’m constantly working on my technique. Even a single day off can cause my muscles to forget what my mind knows by heart. I take class seven days a week, even though the company only works five days each week. I know that I’ll never perfect the ballet technique—ever. That’s why I love it so much. It never becomes boring, even though I’ve done all these movements in this very studio a million times over thirteen years. It’s my safe place, where I can experiment. I sweat, grunt, and make faces that would never pass on the Metropolitan Opera House stage. It’s the time to push myself beyond my limits so that my performances can feel ­effortless, fresh. Not everyone wants to push themselves to that brink of breaking, but it’s what you commit to when you’re a professional—the very present reality that you may break instead of bend. Today, I don’t jump. My left shin has been hurting, and I don’t want to risk straining it before tonight’s performance. I have always been known as a jumper, able to soar to great heights and land like a feather on the stage. The Firebird flutters and flies. But it has been difficult to practice her grand jumps the past several weeks. The pain in my leg has been intense, and I’ve had to save every bit of my strength for the actual performances. By now, I am as familiar with the feral gestures of the Firebird as I am with my own breath, my own heartbeat. American Ballet Theatre’s spring season has been under way for six weeks, with two more to go, and I’ve previously performed as the Firebird twice in Southern California, barely an hour away from my hometown. I have a light rehearsal around noon at the Met, to space the choreography and get the feel of the stage. I want to be sure that I hit all of my marks, that I’m always in the right place so I don’t collide with the corps de ballet during my variations or move out of sync with my partner when we dance our pas de deux. When the public walks into the hallowed space of the Metropolitan Opera, it sees its gilded foyer, its luxe patron boxes, and its grand stage. But behind the scenes there are studio spaces where performers can hone their magic, eking out a final practice before the show begins. I spend part of the afternoon in one of those rooms for a private rehearsal with Alexei Ratmansky, Firebird’s choreographer. Alexei, ever the visionary and perfectionist, is changing the choreography up until the last minute. He tweaks a leap here, a twist there. We go through all my solos to ensure that the counts are exactly right. Beat one. On my toes. Beat two. Dart to the right. Beat three. Bound through the air. Alexei changes my entrance to the stage several times before we finally agree on the steps that best suit me. There are two other casts, and the Firebird’s entrance in each is different, difficult, unique. I feel energized. I feel ready. I walk home to my apartment, a dozen blocks from the Met. I shower and flip to the Food Network just to have some background noise as I try to relax my mind, wind down my body. A couple hours later, I’m back at the Met. The curtain won’t go up until seven thirty p.m., and I won’t take the stage until nine, but I want to be early, to not have to rush. It is a special evening, and not just for me. Kevin McKenzie, ABT’s artistic director, is also being honored. It is his twentieth anniversary in that role, and in celebration there will be speeches, a video tribute featuring congratulations from the artistic directors of nearly every major classical company in the world, and performances by all of ABT’s principal dancers. It’s getting close to showtime. I have been a soloist for five years, and the eleven of us have a dressing room all to ourselves. But I have never used it. I prefer the comforting camaraderie of the dressing area shared by the corps. I spent six years as part of the corps de ballet, and with them I want to remain, preparing for my first principal role in a classical ballet surrounded by loving friends. Nothing feels different between us, even though I’ll dance the lead. That, at least, provides normalcy on this extraordinary night. I have my own corner of the dressing room, claimed long ago. The table is so crowded with flowers and chocolates and photographs that there is barely room for me to squeeze my cell phone. There are bouquets of orchids, my favorite, and dozens of roses. Arthur Mitchell, the founder of Dance Theatre of Harlem, has left me a voice mail, wishing me luck. There are dozens more e-mails, texts, and cards—from friends, family, and fans all over the country—wishing me well. Looking at the beautiful bounty, I start to get emotional. But I can’t be distracted. I can’t be overwhelmed. I go into hair and makeup about a half hour after the evening performance starts. In the mirror, Misty disappears and a mystical creature takes her place, its face dusted with red glitter and painted with dazzling red spirals that shoot from the corners of its eyes. Even my inch-long false lashes are colored red. One of the company’s dressers slicks back my hair into a smooth swirl to better attach my red and gold plume. “Good luck, Misty,” a dancer hollers at me with a smile. I know that they wholeheartedly mean what they say. But those are everyday salutations that can be tossed out before any night’s performance. They don’t reflect the monumental nature of this evening, what it means to me and the rest of the African American community. I plop down on the floor of the dressing area’s lounge, stretching, flexing, staring at myself in the mirror. I stamp that thought down as quickly as it emerges. I think to myself, This is it, this is my moment. Finally, the moment to shine, to prove myself, to represent black dancers at the highest level of ballet. But my shin is throbbing uncontrollably. I know deep down that I can’t go on much longer with such pain. Tonight will be the first time I perform as the Firebird in New York, and I pray it won’t be my last. By the time Firebird is up, ABT has performed several other pieces and two intermissions have paused the program. I make my way toward the stage. Kevin McKenzie, the conductor, and the rest of ABT’s artistic staff are standing there, behind the curtain, wishing me luck. I remember the first time I stood on the stage at the Metropolitan Opera House. I was nineteen years old, still struggling to find my place in ABT’s corps de ballet. I traced the marley floor with my pointe shoes and imagined myself on the stage, not as a member of the corps, but as a principal dancer. It felt right. It felt like a promise: someday, somehow, it was going to happen for me. A decade later, I am here, waiting for the moment when I will explode onto the stage in a burst of red and gold. Outside, the largest crowd I have ever seen waits. Prominent members of the African American community and trailblazers in the world of dance who have seldom received their due are here tonight: Arthur Mitchell, Debra Lee, Star Jones, Nelson George . . . but I know I will also dance for those who aren’t here, who have never seen a ballet, who pass the Metropolitan Opera House but cannot imagine what goes on inside. They may be poor, like I have been; insecure, like I have been; misunderstood, like I have been. I will be dancing for them, too. Especially for them. I stand in the farthest upstage wing when the curtain rises. There are a flock of “Firebirds” who enter the stage first after Ivan, the prince. I can feel the anticipation rolling off the crowd as they pose and preen. They expect me to be among them. I take a deep breath. The music starts, and with it comes the cheers, a great roar of love from the audience. I realize in that moment that it doesn’t matter what I do on the stage tonight. They are all here for me, with me, here for who I am and what tonight represents. I run onto the stage and feel myself transform. As I approach center, my flock parts, leaving me to stand alone. There’s a brief second of silence before the audience erupts into applause once more, clapping so loudly I can barely hear the music. 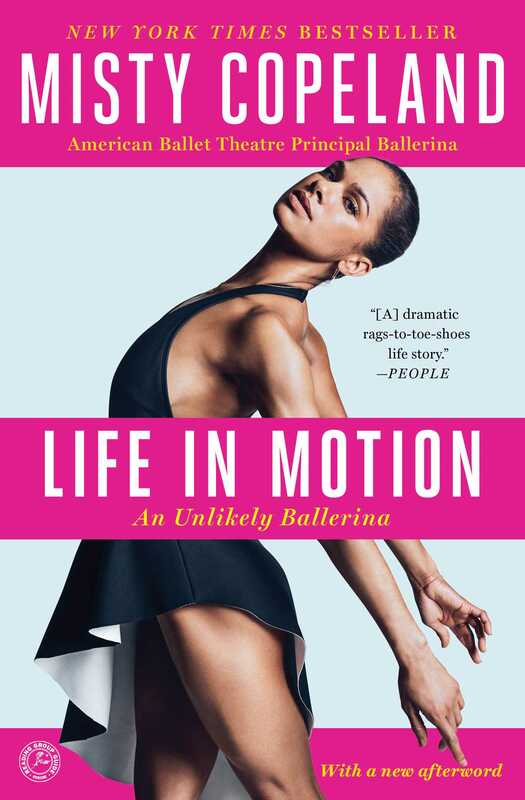 This reading group guide for Life in Motion includes an introduction, discussion questions, ideas for enhancing your book club, and a Q&A with author Misty Copeland. The suggested questions are intended to help your reading group find new and interesting angles and topics for your discussion. We hope that these ideas will enrich your conversation and increase your enjoyment of the book. When thirteen-year-old Misty Copeland first walks into a ballet class at the Boys and Girls Club in San Pedro, California, she has no idea that this will change her world. Her chaotic home life, filled with five siblings and her mother’s changing husbands and boyfriends, is in stark contrast to the control, beauty, and grace Misty experiences in ballet. A seeming ugly duckling, with a small head, sloping shoulders, and big feet, Misty learns that she has the ideal body for ballet. She has the uncanny ability to copy complex steps perfectly. Life in Motion is Misty’s personal account of her journey to become the first African American soloist at the prestigious American Ballet Theatre (ABT) in more than twenty years. Misty relates the challenges she faced, from living on food stamps to a bitter, highly publicized custody battle between her mother and her dance teacher. Through it all, Misty remains true to herself and committed to her goal. Her remarkable story will inspire anyone struggling against seemingly insurmountable obstacles. Misty Copeland is proof positive that with perseverance, dedication, and a little bit of luck, dreams can come true. 1. Misty’s relationships with the male figures in her life often bring her strength. Misty describes her wonderful relationship with Harold, her mother’s third husband. As she says, “Memories of Harold are never cloudy, only clear and bright.” Her relationship with Olu brings her strength and confidence, especially in finding her place at ABT and becoming a mentor to others. Why do you think these influences are powerful for her? Can you contrast them with the less-positive legacy of her mother’s husbands and boyfriends? 2. Misty contrasts her shyness to the confidence she feels dancing and performing. Of her childhood she says, “I felt awkward, like I didn’t fit in anywhere, and I lived in constant fear of letting my mother down, or my teachers, or myself.” How do you think her introverted personality affects her as a performer? Can anxiety become a strength, rather than a weakness? How does she learn to cope with it? 3. Misty finds support and encouragement from ballet teacher Cindy Bradley, who invites Misty to leave her mother’s meager, overcrowded apartment to live with the Bradley family. What could Cindy provide Misty that her mother could not? In what ways does Misty connect with other maternal or supportive figures after she leaves the Bradleys? 4. Misty has a complex relationship with her mother: “I love my mother, but I’ve never really understood her.” Their relationship is taxed to the breaking point when Misty’s mother forces her to leave the Bradleys and return home. Eventually Misty withdraws her petition to become a legally emancipated minor that Cindy helped her request. Do you think this was entirely Misty’s decision? How did this painful process affect Misty’s dancing career? Her relationship with her mother? 5. Misty’s childhood was one of intermittent poverty and rootlessness. Her mother was continually running away from bad situations. How did this affect the way Misty dealt with obstacles later in life? 6. Consider Misty’s many experiences with prejudice. Her mother’s fourth husband, Robert, displayed a penchant for abusive racial epithets, and Misty finds bigotry pervasive even in the world of ballet, where she must often paint her face lighter for performances. To what degree do you think racism has affected Misty’s career as a dancer? What have her experiences taught her? 7. Did Misty’s discussion of the myth of eating disorders and ballet surprise you? Discuss that and any other preconceived notions you may have had about ballet before reading this book. Which were dispelled? Which were proven accurate? 8. When discussing her friend and fellow dancer Eric Underwood, Misty wonders if what led them both to dance was serendipity or destiny. Which do you think it was for Misty? What does Misty seem to believe? 9. Misty says, “Mommy had always been afraid that I’d given up my childhood for a dream.” Do you think she did? If so, was it worth it? 10. Misty admits to being a perfectionist since childhood. By the end of the book, how does Misty come to terms with the idea of perfection? 11. To this day, ABT has never had an African American principal dancer. What do you think of Misty’s campaign to be the first? 12. The book begins and ends with Misty’s dancing the role of the Firebird. What is the significance of the Firebird, both her performance and the character, to Misty? 1. Get into the spirit of things: find a local ballet studio and attend a recital, or even take a beginner’s class. Many schools offer classes for adult novices. If you have questions about ballet, there are many helpful Internet sites. ABT’s website offers a dictionary of ballet terms, some with video illustrations (http://www.abt.org/education/dictionary/). Britain’s Royal Ballet has uploaded many videos on the and ballet steps and terms and the history of ballet; see https://www.youtube.com/playlist?list=PL7E40E6E2DAB561B5 and https://www.youtube.com/playlist?list=PLFEuShFvJzBww3lVbFABGB0HbIxNQ2 TiA. 2. Have the members of your group talk about any early experiences with the arts—dance lessons, musical instrument classes, visual arts lessons, etc.—then compare your experiences. Is any member of your group still practicing his or her art? Discuss what art added to your lives. In the book you are very candid about the struggles of your early childhood. Do you think those experiences were a help or a hindrance to your determination to become a ballerina? They were absolutely a help. You need perseverance, determination, and drive to succeed in the ballet world. All of my faults and insecurities as a child were highlighted by ballet and it pushed me to prove myself despite them. In the end, wanting to please people, striving for perfection, even survival, are all attributes a ballerina needs to have. In addition to your work with ABT, you also discuss working with Prince, being a judge on a national TV dance competition, and working with the President’s Council on Fitness, Sports and Nutrition, which helped introduce ballet to a wider audience. What kind of results are you seeing from helping to make this art form more popular and democratic? The most impressive is seeing a more diverse audience at the Metropolitan Opera House. That is huge for ballet, as well as seeing a ton of brown ballerinas willing to step into this secluded world because they can see spaces for themselves now. You express a great deal of affection for New York City from almost the moment you arrived for ABT’s summer intensive program. Do you still feel the same way about it? I feel the same. The yearning I felt while away from NYC as an adolescent is a bit less dramatic now. I’m always happy to be home here, but I don’t feel as though I’m missing out on the fast pace energy and growth of the city as I once did. Many of your awards and accomplishments in ballet are even more remarkable because you are often the first African American to achieve them. In what ways do you think the world of ballet is changing for future performers? For the audience? I think it will be after my retirement from ballet that I will realize the weight put on me by being the first. I am so “in it” now, and focused on the challenges of becoming what I need to be from day to day, that I don’t float above myself and see the scarier picture of not living up to expectations. But things are changing daily. It’s exciting. To see myself reflected in the younger generation of ballet dancer helps give me hope. Although they are both art forms, ballet and writing are extremely different. Did you enjoy the writing experience? Were there any particular challenges for you? I really enjoyed it. I’ve always enjoyed writing in journals. It was my way of expressing myself before I really knew how to speak up for myself more publicly, so the whole experience was very cathartic. The most challenging part for me was letting go of the story and putting it out into the world, and also giving Charisse Jones, my coauthor, the freedom to do what she does and just help me write! It was scary to trust someone with my life story. In the book you confess the very human tendency to focus on the rare negative comment or criticism amid a sea of praise. Did you read the reviews for your book? How did your experiences with reviews for your performances affect the way you handled your book reviews? If anything I’m even more prepared for my book reviews because I’ve experienced those performance reviews. The book stuff is a bit different in that these are my life experiences, so it’s hard to imagine someone would judge or critique another person’s life experiences by any objective measure. It’s another thing to be a part of a subjective art form where you have to be thick skinned enough to handle criticism. But to have someone place judgment on an experience they never had personally is strange. In addition to this memoir, you’ve also written a children’s book. What stories do you dream of telling next? The history of minorities, especially brown people, in the classical ballet world. I want to share my experiences in this unique setting as well as undiscovered and untold stories of generations of stories before me. This book was a national bestseller, and while on tour, you had the opportunity to engage with many of your fans one-on-one. What advice or insight would you like to leave your readers that you might not have addressed in this memoir’s pages? That I’m nowhere near the be-all and end-all for ballet. I just want to spark interest in an unlikely audience and to bring awareness and education to those who may not otherwise feel welcomed. Misty Copeland made history by becoming the third African-American ballerina for the American Ballet Theatre, the first in decades. A recipient of the Leonore Annenberg Fellowship in the Arts and an inductee into the Boys and Girls Club Alumni Hall of Fame, she currently lives in New York City. Visit her online at MistyCopeland.com. An unexpected page-turner...Her story is an inspiration to anyone—man or woman, black or white—who has ever chased a dream against the odds, and the grace with which she triumphs is an example for us all. Engaging... [Copeland is] a poised, intelligent writer whose temperament—disciplined, determined, driven—gives the book a special spark… In LIFE IN MOTION, she looks back on the past without bitterness or anger, only gratitude. Hers is an out-of-the-ordinary story about defying stereotypes, and she shares it in an inspiring narrative that’s enlivened by her own grace and generous spirit. Instead of rags to riches, Copeland goes from baggy shorts to leotards as she navigates the whitewashed world of ballet. It's no wonder Misty Copeland is a role model for countless aspiring ballerinas. Reads as a modern day Cinderella story…this memoir is an inspirational read—especially for aspiring dancers. [A] dramatic rags-to-toe shoes life story. Misty’s unwavering belief that we can be anything that we dream is an inspiration – an inspiration to break the mold, follow your passion, never take no for an answer and do it all with grace, kindness and the spirit to help others on their journey. I am thrilled that my two daughters have a role model in Misty, who is breaking down doors that that they will never have to. A raw, honest tale….Her memoir is filled with passion, pain, success, and…pure joy. Misty Copeland, a ballerina of extraordinary talent and charisma, offers an autobiography as mesmeric as her dancing. She overcame adversity in the studio, in her home life, and in ballet's own traditionalism to become one of its brightest stars — her passion and perseverance will inspire dancers and non-dancers alike. – Eliza Minden, author of The Ballet Companion and Co-Founder and Head of Design at dancewear company Gaynor Minden, Inc.
[Misty Copeland's] book is a breezy read for such deep subject matter, but her beautiful and prevailing spirit shines through on every page. Reading her memoir...it becomes even more apparent how this 31-year-old woman has parlayed her natural talent along with an uber intense discipline, passion and focus, into a stellar career. Misty Copeland’s LIFE IN MOTION is an inspiration to all young people. She is the Jackie Robinson of the ballet world, and a true role model for an entire generation of new ballerinas. [LIFE IN MOTION] is the stuff of which movies are made. What a remarkable, encouraging story. Written naturally, modestly, and conversationally...[readers will] feel her triumphs and tragedies, wincing whenever she falls and cheering her on every time she gets back up….Brava, Misty. A tale of hardship and remarkable success. A poignant primer proving the power of perseverance in the face of adversity. An important book for teen collections. Told in graceful prose...[Copeland's] achievements will encourage all those attempting to beat the odds in competitive fields. [Parts] the curtain on the ballet’s central illusion: that it is empowering for the female dancers at its centre. Providing a behind-the-scenes look at the glory and gore of ballet...you find yourself rooting for her. A gift to all balletomanes, not just the brown ones. She embodies both fearlessness and femininity, reflecting the life of contradictions and obstacles over which she’s leapt so beautifully. If ever a solo ballerina was poised to become a household name, it’s now. "Although ballet fans never lack for darlings, rarely does a dancer become an old-fashioned star...her path to becoming a star ballerina has been as dramatic, unlikely, and hinged on coincidence as the plots of most ballets." The story Copeland tells about her rise to ballet glory is compelling and inspirational.